Mark Waid drops a bomb on us (and Daredevil) this issue in what feels like a huge climax/turning point of the series. The Shroud (never did trust him) has been using Owlsley to hook into the power grid, giving him eyes everywhere and the ability to broadcast through any and every screen in the city. I’m not exactly sure how that works with Owlsley, but it sounds cool and it’s very impressive visually. He turns this against Murdock and his friends, exposing Foggy’s death hoax and broadcasting all of Matt’s private client meetings for the whole city to see. Without a secret identity, suddenly neither Matt nor Daredevil have anywhere to hide, they’re on the run for now, but with so many people seeking them out, and Shroud’s all seeing eyes, it can’t last long. Decided I don’t like the costume change, the red suit is cheesy and the haircut is bad. 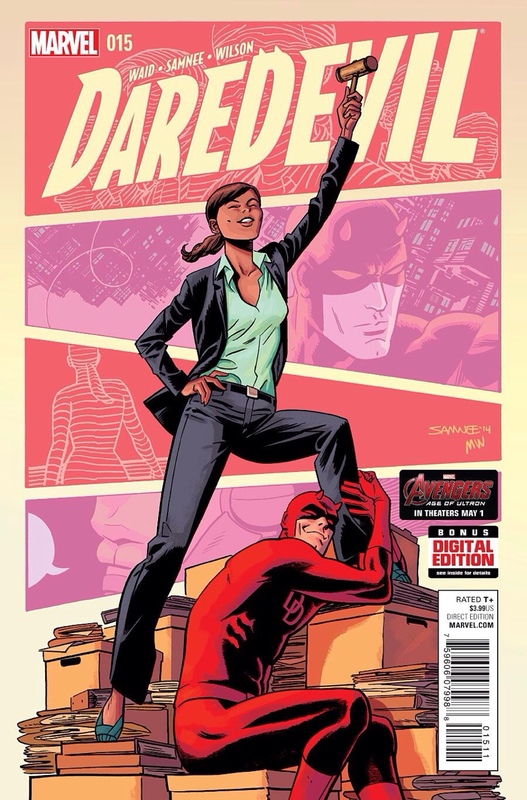 Chris Samnee, Daredevil, Man Without Fear, Mark Waid, Marvel Now!